There are over 50 U.S.cities that have annual celebrations! Let’s join with the French this week in the celebration of Bastille Day! And why not do it with enjoyment of some French Food! Simple but delicious summer combination. 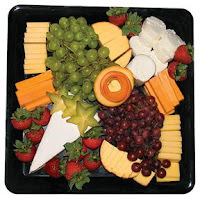 Fruit, Cheese, and Baguette Tray. With a nice glass of wine. Don’t make it complicated. Choose some fruit that is easy to eat. Cherries, grapes, melon and/or strawberries. These are so easy to wash/clean and put out on your tray. Add some cheese. Choose a soft cheese like Brie, a hard sharp cheese like Cheddar or Gruyere, and a pungent blue or gorgonzola. Leave them in large pieces with implements for guests or cut them up as you want. Some picks might be supplied for eating. For the wine, please make it a favorite of yours. If there are enough guests, you may want more than one variety. If the gathering is more intimate, choose a favorite and go with that. Add this wonderful French Baguette. Baked in your own oven. It’s available from Sturdiwheat and is as easy as the rest of this simple service. You can’t do better than this bread for your guests. And it is so easy to make. As with most Sturdiwheat products. Just add water. You will be an artisan baker with everyone enjoying this very special treat without having to travel to France. You might have guests just tear off pieces of the bread, or you could slice it in diagonal pieces to be enjoyed with the fruit and cheese. You might put out some unsalted butter for those who desire it. You can form these loaves so easily and bake them just before serving. Or you can bake it early and serve at room temperature. But think about it – that smell of fresh bread in the oven for your guests. What an added indulgence. Enjoy the tray – Sip a favorite wine – and savor this warm, delicious baguette. It makes me hungry! Oh! Don’t forget the French Crepes! Breakfast, lunch or dessert…these are great anytime. Beautiful and delicious with , fresh strawberries, raspberries, blueberries, lingonberry or any fruit preserves, and cream cheese. Oh and of course the whipped cream!